The Topspin puzzle is by Binary Arts (now called ThinkFun), but is also sold as No. Crunch under their XEX brand name. It consists of 20 numbered round pieces in one long looped track. You can slide all the pieces of the loop along. There is also a turntable in the loop which can rotate any four adjacent pieces so that they will be in reverse order. This in effect swaps two adjacent pieces and the two pieces on either side of them. The aim is of course to place the pieces in numerical order. It was invented by Ferdinand Lammertink, and patented on 3 Oct 1989, US 4,871,173. There also exists a larger version from Taiwan with the catchy descriptive name "Educational Logic Game". It has 26 pieces in the loop, which are either numbered or have letters, and a turntable that can hold 5 pieces. It also two small side-tracks which each have one black piece and room to hold one further piece taken from the loop. 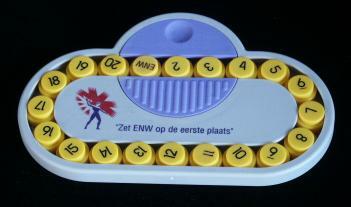 If these sidetracks are used the puzzle becomes trivial, but in this way it is supposed to be suitable as an educational toy for children learning to count or form words. 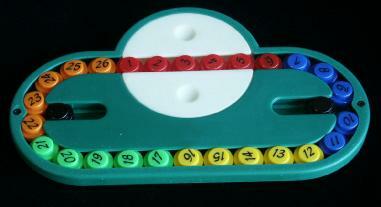 This puzzle was patented by Chiu-Huang Chang on 12 April 1997, US 5,622,368. There are 20 distinct pieces, which can therefore be put in at most 20! possible positions. All these are attainable, so there are 20!=2,432,902,008,176,640,000 distinct positions. If rotations of the loop are considered to be the same, then there are only 19!=121,645,100,408,832,000 positions. Ignoring the sidetracks, there are 26 distinct pieces which can therefore be put in at most 26! possible positions. Without the sidetracks it is not possible to achieve all of these because the even and odd numbered pieces will always remain alternating, so there can really be at most 2·13!2 positions. However, the permutation parity of the even numbered pieces is equal to that of the odd pieces, so this leaves only 13!2 = 38,775,788,043,632,640,000 distinct positions. If rotations of the loop are considered to be the same, then there are only 13!2/26 = 1,491,376,463,216,640,000 positions. Passion For Puzzles has an online playable version. TopSpin on the Symmetric Group (pdf) by Curtis D. Bennett is an article on the maths behind this puzzle, also available in the book The Edge of the Universe: Celebrating Ten Years of Math Horizons. Mike Archer has a Windows TopSpin simulation. Oval Track and Other Permutation Puzzles is a book by John O. Kiltinen that includes analysis of the Hungarian Rings. Phase 1: Place pieces 1-16. This is very easy. Simply find the next piece to solve and do any move that brings it closer to the solved part of the loop, but which does not move any already solved pieces. Then bring it to a position such that there are three pieces between it and the solved part and then a single turn will append it. Phase 2: Place pieces 17-20. First I will show a method with few moves but which I find hard to memorise. Afterwards I will show the method given in the leaflet that comes with the puzzle which is easy to remember but takes more moves. Turn the four unsolved pieces if necessary, so that as many pieces as possible are solved. If the same number of pieces is solved either way, then turn it so that piece 17 is as close to piece 16 as possible. To cycle 3 pieces around, simply follow the moves shown in the table below. Phase 2b: Place the last few pieces - Easy but longer method. The following sequence moves one piece along the ring, but doesn't change the order of any other pieces. The sequence above shifts a piece along, jumping over four other pieces. If you keep shifting a single piece all the way around the loop once or twice, it will eventually visit every possible position (because there are 19 other pieces which are jumped over 4 at a time, and the numbers 19 and 4 are co-prime). This way each piece can be individually positioned wherever you want it. If you wish you can turn around the turntable without disturbing the pieces by using the move sequence below. Phase 1: Place pieces 1-21. This is very easy. Simply find the next piece to solve and do any move that brings it closer to the solved part of the loop, but which does not move any already solved pieces. Then bring it to a position such that there are four pieces between it and the solved part and then a single turn will append it. Phase 2: Solve pieces 22-26. Solve 23 and 25, simply swapping them if necessary by turning over 22-26. Note: This puzzle does not have the parity problem that ordinary Topspin does, so despite being larger in every way, it is very much easier to solve.